From the Anvil latches are ideal for cottage doors, barn doors, shed doors, garden gates or any other exterior door which simply requires the gate or door to be fastened. These latches can be paired with door locks for complete security and privacy. 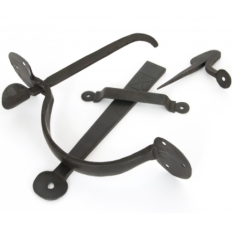 Our range of latches is available in a variety of styles, including traditional latches, such as cottage latches, and other more decorative and unique latches, such as the Shakespeare latches. In addition to these latches, we also supply privacy latches and thumb latches. Privacy latches are perfect for single side access or for specific rooms that require privacy, including bathrooms, toilets and bedrooms, while thumb latches are ideal for in-swinging gates. For interior doors and front doors, we have available a wide selection of door handles, from lever handles on rose, lever handles on a backplate to door knobs. These door handles and door knobs are ideal for rustic houses, modern apartments and a variety of other settings, giving any door a unique and functional handle. Besides being functional, these door handles are highly decorative and will also stand out as an exclusive décor piece for your doors.